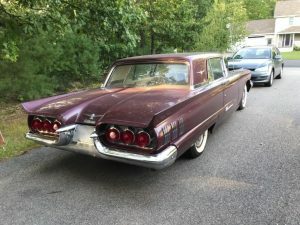 This week’s featured car donation is a futuristic antique Thunderbird that supported Maine Public! Want to know more about this car’s fascinating history, and how to turn an old car into radio programming? Read on! The Ford Thunderbird is an iconic American car, and the very first model was produced in 1955. 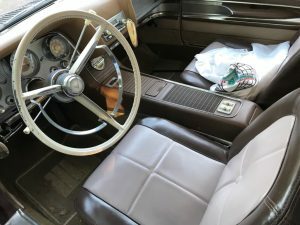 Those early cars were initially two-seaters, which certainly was nice for zipping around, but didn’t quite meet the requirements of the standard American family. In 1958, Ford decided to expand the Thunderbird – literally – by adding a backseat. These so-called “square-birds” were wildly popular, and even named Motor Trend Magazine’s Car of the Year. Not so square after all! Thunderbirds made their mark in popular culture as well. 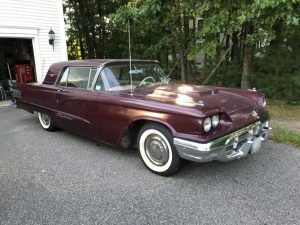 Fans of the Beach Boys may recall the track “Fun Fun Fun,” about a girl’s adventures in her classic T-bird. Bet your bottom dollar that a Maine Public Radio station is playing on that radio? Most cars in Maine are at one point or another moving the sounds of Maine Public’s many stations. This vintage car helped move Maine Public into the future, as a vehicle donation. The Maine Public Broadcasting Network is comprised of ten radio stations across the state. The cooperative of community-based stations first broadcast in 1992. MPBN’s radio and television signals reach almost all the populated area in Maine. They have over 60,000 sustaining members, which makes MPBN the largest nonprofit membership group in ME. The support of these listeners and viewers allow the network to provide free, everyday service across the state and beyond. Listeners to Maine Public are familiar with the network’s commitment to the pursuit of truth when it comes to the issues that matter most to Maine. Do you want to support the wonderful work of Maine Public, or your favorite local station? We make it easy to donate your car. All you need to do in order to donate your car to NPR is to visit our website or give us a call at 877-215-0227. Just provide some simple information about the car donation, and we will locate a towing agency in your neck of the woods. We will tow away your car in no time, and you’ll receive a tax receipt for the vehicle donation. Turn your car into your favorite radio programs with our easy car donation program!